With cycling of all kinds becoming more popular, trendy even, the bike messenger’s job has become a romantic ideal for the teenage hipster. There are videos all over YouTube of bike messengers in places like New York City or San Francisco sporting slick track jackets and calf tattoos while defeating traffic with their fixed-gear skids and narrow handlebars. Google search “bike courier,” and you come across any number of websites about messenger-specific alley cat races and contests to see who can carry the heaviest or most ridiculous objects strapped to their Chrome bags. All this romanticism is acceptable because the job does sound pretty cool, but does anyone wonder about the winter? “We ride all year round,” says Patrick Beecroft, who has been a bicycle messenger for three years with Legal Messenger Inc. (LMI). This is his fourth winter season. Bike messengers, or bike couriers, are employed to execute all sorts of transactions for clients. “Most of the work in Salt Lake is legal in nature, so we spend a lot of time at the various courthouses and state and county facilities in town,” says Beecroft. Messengers are employed to file new lawsuits, carry packages, register new companies and more. Beecroft enjoys his job because every day brings something different. Some days he has a slow routine and others are a scramble to the finish line. If you are native to downtown, you’ve probably seen these messengers riding their bicycles. There are two courier companies in SLC, LMI and Salt City Couriers. Although the cyclist is the face of these companies, there are other ways to get the job done. LMI, for example, has some people in cars. This means winter conditions, too. “We’re usually busier during the winter ––mostly because our clients tend to take more time off in the summer than in the winter months. We also see a boost in the winter because others are less likely to want to go out into the cold, snow or rain on an errand, so they hire us,” says Beecroft. Some courier firms provide bicycles for their couriers while others, like LMI, expect employees to provide their own bikes. LMI does provide masks specialized for cycling that help filter out pollution from winter inversion. 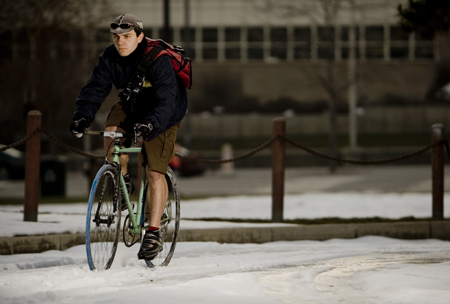 Beecroft prefers a fixed-gear road bicycle (with a front brake) over a mountain bike and does not switch to a mountain bike in the winter unless it’s necessary. When it comes to being prepared, Beecroft swears the coat is everything. “Occasionally, I’ll wear knee warmers when it’s 20 degrees or below outside. Otherwise I’m in shorts and a T-shirt underneath my jacket. I’ve got different jackets for really cold weather, rainy, windy and snowy conditions.” Beecroft and his fellow couriers also make sure to have front and rear fenders, glasses and sometimes goggles to keep the sleet and snow out of their eyes. Avid cyclists don’t think twice about commuting or just hitting the road for fun during the winter. They throw on a pair of goggles and a winter coat and head out. Many outside the cycling community simply can’t fathom the idea of winter riding. Beecroft’s favorite season to ride is autumn. When asked if he prefers the cold over the heat, he says, “I’d take 100 degree-plus weather over winter any day.” Even though warmer weather is his preference, he still takes pride in his work and manages to have fun in the winter. “Sometimes weather conditions can immobilize car traffic in the city, but we can always get our bikes through traffic to get the city’s work done on time,” he says.